Beauty standards differ depending on where you are in the world, and so do the products that promise to make you prettier. In our Globetrotter series, we highlight our weirdest and most worthwhile finds from overseas. I’ve grown to love sheet masks for their instant complexion pick-me-up powers and abilities to scare my husband silly. Even Marilyn Manson wears them! But there is a new type of mask that has gotten the attention of Korean women. 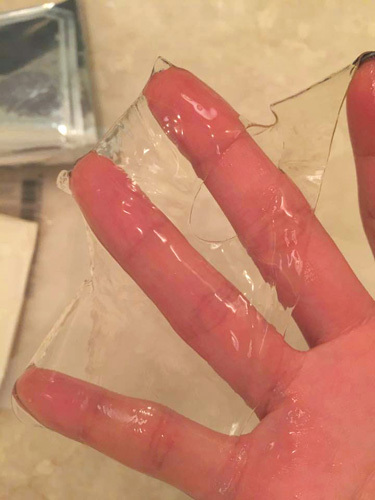 In fact, according to Christine Chang and Sarah Lee of K-beauty shopping site Glowrecipe.com, sheet masks are so 2013 and hydrogel masks are the next best thing. The main difference between a sheet mask and a hydroogel mask is the material. 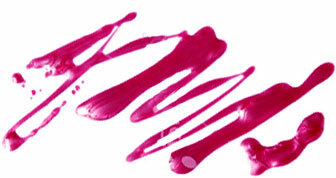 Sheet masks are usually a thin, treatment-soaked piece of cloth, while hydrogel masks have a thin gel form. They have the ability to lock in moisture much better than cotton. A closeup of the mask via Glowrecipe.com. The Glow Recipe gals recommended the Whamisa Organic Fruits & Tomato Fermented Hydrogel Facial Mask for its amazing skin-plumping and hydrating benefits. I tried this unique treatment over the weekend and loved the results. The mask was super thin and completely transparent – my husband got a kick out of my glass-like face as I was wearing it. Whamisa is known for using organic ingredients like vegetables and fruits that are naturally fermented. This mask is made with fermented tomato, apple, licorice and banana to rehydrate and soothe dry skin. While the slimy gel was a little hard to unfold and apply, the extra effort was totally worth it. My skin felt instantly better after facing a cold and wet morning of shoveling snow. The best part? Hydrogel masks are a lot easier to wear. They form to your face better, allowing the benefits to sink into skin. They also stay put without slipping and sliding when you’re standing up right. I was able to do the dishes with it on without having to look up at the ceiling. 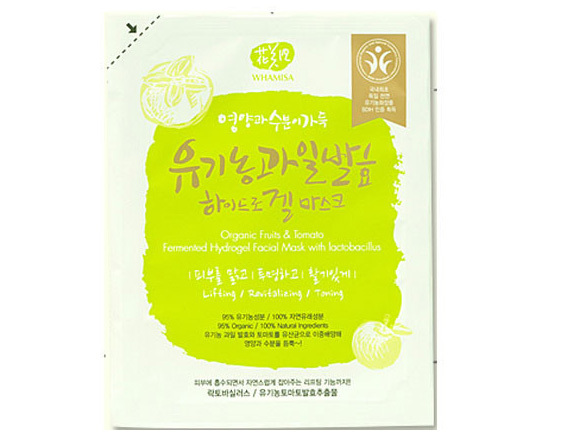 Whamisa Organic Fruits & Tomato Fermented Hydrogel Facial Mask ($9) is available at Glowrecipe.com now.